WASHINGTON — The U.S House of Representatives voted Nov. 30 to pass S.1555, the Filipino Veterans of World War II Congressional Gold Medal Act. The bill will recognize Filipino veterans who fought for the U.S. during World War II with a Congressional Gold Medal, the nation’s highest civilian honor. The Senate passed the bill unanimously over the summer, and it will now be sent to President Obama to be signed into law. • Rep. Judy Chu (D-Pasadena), CAPAC chair: “I am thrilled that the U.S. House of Representatives passed legislation today to grant long overdue recognition to our Filipino World War II veterans … More than 200,000 Filipino soldiers served bravely alongside American forces and played a critical role in ultimately helping the United States to achieve victory in the Pacific. 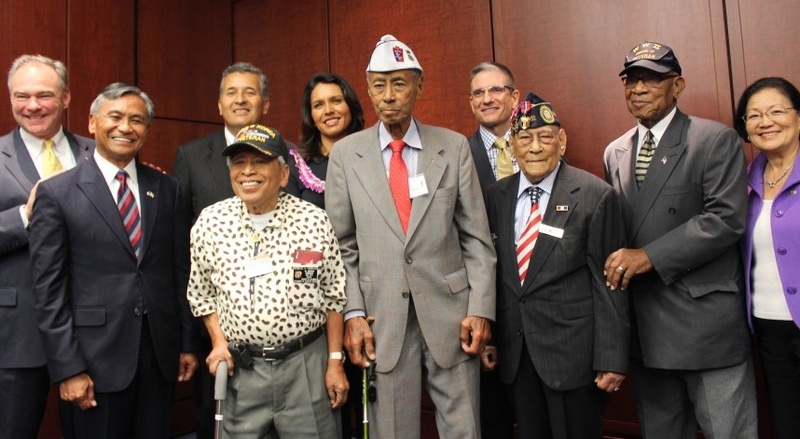 We in CAPAC have made it a top priority to ensure that these Filipino World War II veterans receive the benefits and recognition that they deserve, and the passage of today’s bill is a tremendous victory for our veterans and the broader Filipino American community. • Rep. Mark Takano (D-Riverside), CAPAC whip: “Over 200,000 brave Filipino people fought in World War II as members of the United States Army Forces in the Far East (USAFFE). Just like any other American who dutifully served their country, the Filipinos who served in the USAFFE endured hardships and sacrificed much while fighting for the ideals our country holds dear. Yet, their service has remained unrecognized since 1946, when the Rescission Acts deemed that these Filipino soldiers did not serve in active duty, and were subsequently denied their full veterans benefits.